This is a continuation of my earlier post on Windows Azure Backup Preview. In the previous post, we discussed how you can generate a self-signed certificate using makecert.exe on the server from which you intend to backup. 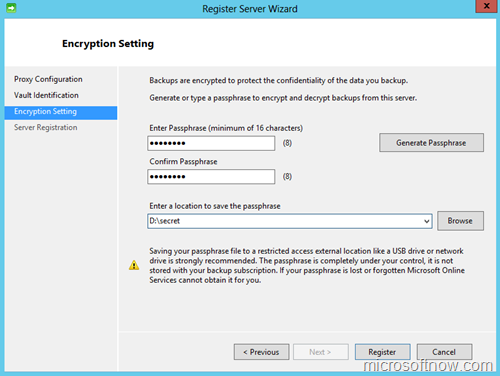 If you want to backup from multiple servers, you need to export the certificate you generated on the first server along with the private key and import it into the Personal store of the other computers that you intend to backup from. 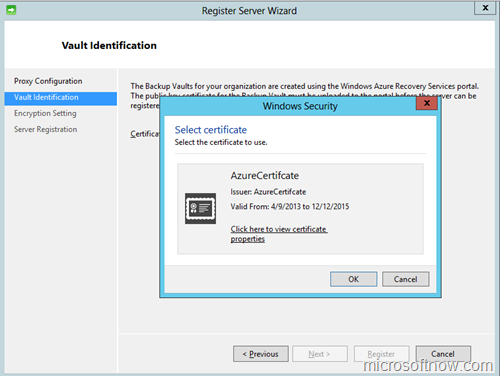 Windows Azure identifies which online backup vault to upload to using this certificate. You can use the same certificate on computers in different networks, domains or workgroups. 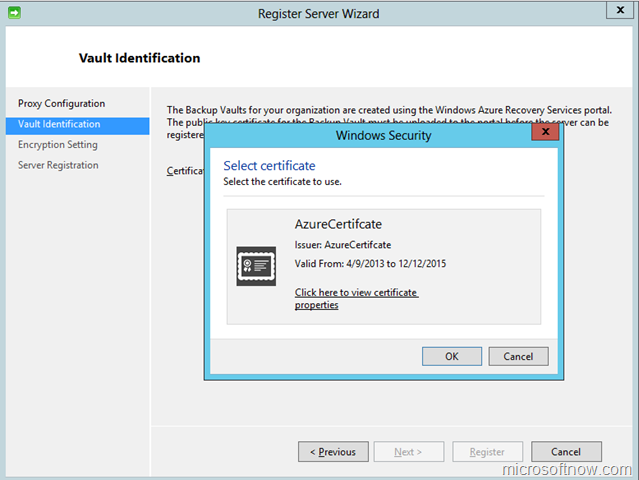 Upload the certificate by clicking Manage Certificateon the Windows Azure Management portal. 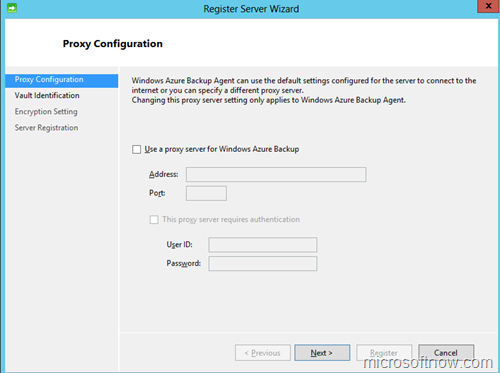 Download and install the backup agent on your server. 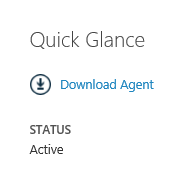 Currently, the agent supports Windows Server 2012, and Windows Server 2012 Essentials and System Center 2012 SP1 Data Protection Manager. You will find the download link on the right pane. 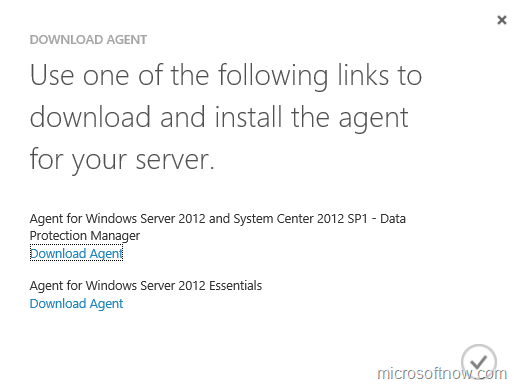 The Windows Azure Management portal gives you download links to agents for Windows Server 2012, Windows Server 2012 Essentials and System Center Data Protection Manager. However, Scott Guthrie’s blog post mentions support for Windows Server 2008 R2, while a Microsoft employee suggests that WS2008R2 support might be added in coming months. Installation is fairly straightforward. Having PowerShell installed is a prerequisite. The Windows Azure backup agent is updated via Windows Update. 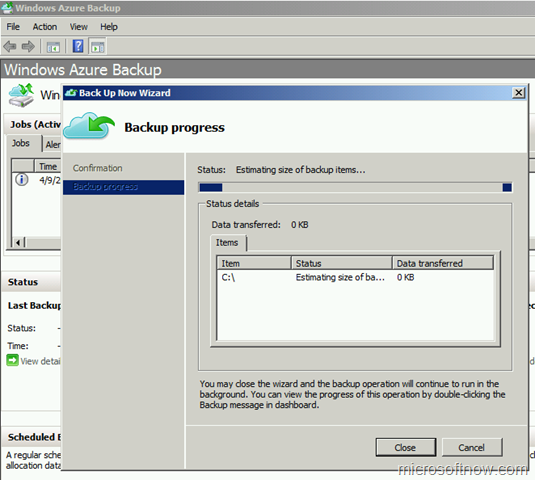 Open Windows Azure Backup using the icon placed on the desktop. 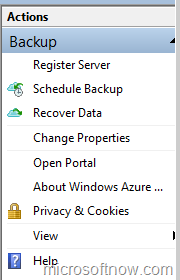 On the right pane of the Windows Azure Backup console, click Register Server. Configure the proxy if needed. On the next screen browse for and select the self-signed certificate you created in Part 1of this post. Click the Register button. The wizard will then proceed to fetch the backup vaults from Windows Azure. 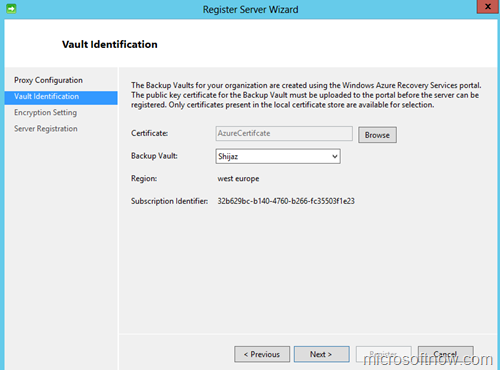 Select the Backup Vault you created. On the next screen, enter a passphrase to encrypt your backup with. 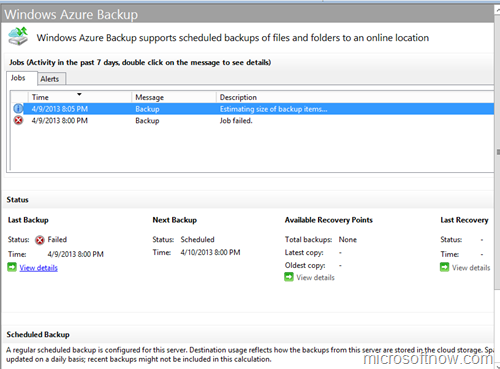 This ensures confidentiality of the data you backup to Azure. Make sure you save the passphrase in a safe location. Click Register and you are now ready to configure backups for this server. 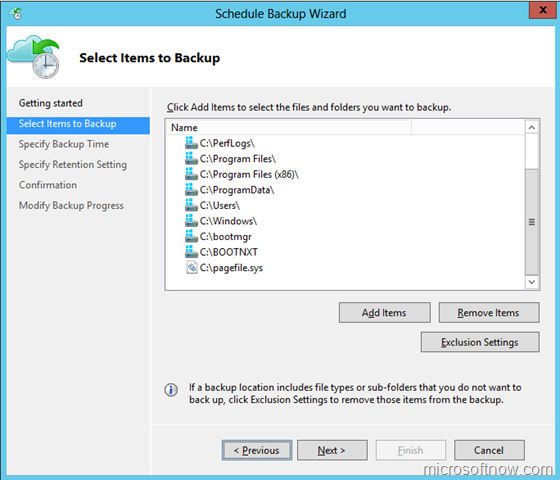 Click on Schedule Backup in the right pane of the MMC console. 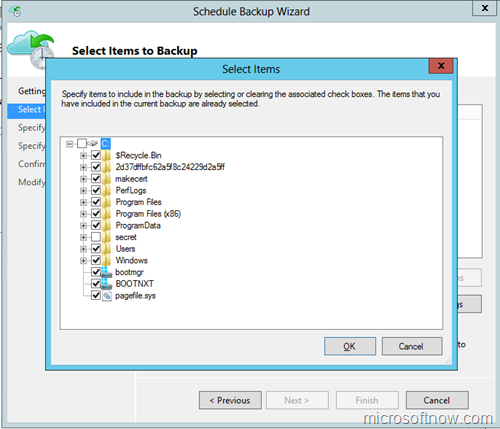 Select the items you need to backup. You can use Exclusion Settings to exclude certain file types from being backed up. Click Next. Set your backup frequency/schedule on the next screen. 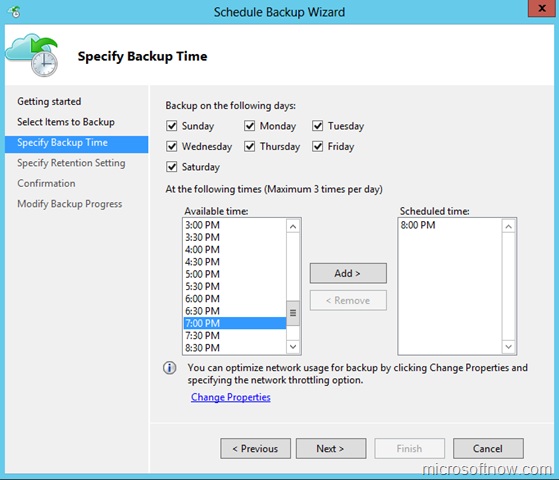 You can choose the days the backup should run and at what time. You can execute up to 3 scheduled backups per day. Click Change Propertiesif you wish to set network throttling settings, to optimize bandwidth usage during working hours. On the next screen, choose your retention settings. 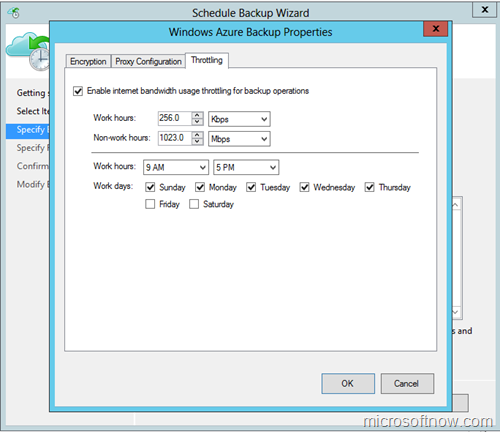 The more older backups you retain, the more storage you will consume on your Azure subscription. Click Next, review your configuration and click Finish to create the job. 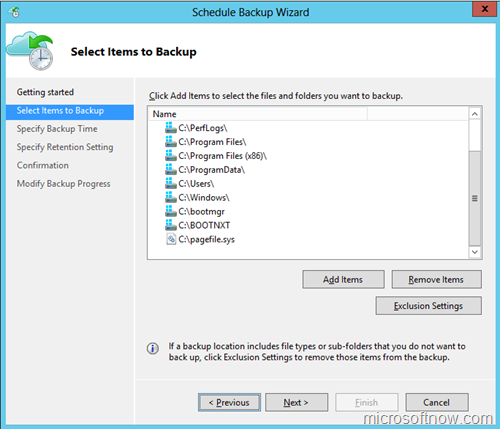 The backup will start running according to the schedule. On the Windows Azure Management Portal, you can see the servers you are backing up, the storage consumed and more information about your protected items. If you want to backup beyond just files, and you want to use Windows Azure Backup with applications like SQL Server, Exchange, SharePoint, etc you need System Center 2012 SP1 Data Protection Manager. I will write a post on how to make this work as time permits. Microsoft is a leader, right behind VMware on the June 2012 Magic Quadrant for x86 Server Virtualization released by Gartner. But wait – in this magic quadrant, Gartner compares Windows Server 2008 R2 Hyper-V and System Center 2007 with VMware vSphere 5. You can imagine what would be the outcome if they were to consider Windows Server 2012 Hyper-V and System Center 2012!! For Microsoft, the cautions are all around sales & marketing, such as penetrating VMware installed base and facing competition. For VMware, however, the caution is about customer concerns around vendor lock-in – specifically around the lack of support for heterogeneous environments, a strength in System Center 2012 that brings flexibility to customers. I recently got myself a Belkin Wireless FSD7050 USB adapter for my Windows Server 2008 R2 test machine. After installing the latest drivers from Belkin, the adapter is detected by Windows, but refuses to ‘enable’. This is because wireless networking is disabled by default in Windows Server 2008 R2. To enable it, go to Server Manager > Features > Add Features > and add the Wireless LAN Service. Exchange Server 2010 SP1 Beta incorporates a number of feature updates including archiving and discovery enhancements, a faster Outlook Web App (OWA), upgraded mobility features, and several improvements in the management UI. The SP1 beta is available to the public and can be downloaded today. Recently, Exchange Server 2007 Service Pack 3 was also made available to customers in 11 languages for both 32 and 64 bit. As highlighted in the recent post on the Exchange Server Team Blog, this service pack was created in response to strong customer demand for Windows Server 2008 R2 supportability for Exchange Server 2007. In addition to the newly supported OS, this service pack also provides updates to a number of core components and the reintroduction of the password reset functionality within OWA for customers using Windows Server 2008 and Windows Server 2008 R2. As part of the Partner Academy, there will be a two-day course on “Inside Windows Server 2008 R2” scheduled for 5th & 6th January 2009 at New Horizons, Doha. The course will begin tomorrow at 9:00 AM. Attendees are requested to arrive on time. This is going to be an in-depth training on the new features in Windows Server 2008 R2, which was released along with Windows 7 in 2009. Please note: This training is open only to Qatar partners who have registered and completed payment towards Partner Academy. The big day is on 15th of December, 2009. The 16th of December will see the launch of Windows 7 in the academic sector. I will be present at the venue on both days, so this will be an excellent opportunity to network with you readers. Some of my managed partners like Mannai Computer, Information & Communication Technology WLL (ICT), EBLA, Qatar Datamation Systems, will also have spaces at the venue, where they will showcase our technologies and their offerings. We have some awesome speakers talking about Windows 7, Windows Server 2008 R2, Windows Phone, xbox, and a host of other new technologies. Alongside other presenters, I will be speaking at the event on the 16th. Exchange Server 2007 will soon be fully supported on Windows Server 2008 R2! The Microsoft Exchange Team is working on an update for Exchange Server 2007 that will enable full support for Windows Server 2008 R2. Watch the Exchange Team Blog for latest information on this update. I wanted to run Windows Server 2008 R2 in a dual boot configuration on my Windows 7 RTM laptop – so that I can demonstrate Windows Server 2008 R2 features to partners when required. This gave me an opportunity to use the new “Boot from VHD” feature on Windows 7 and Windows Server 2008 R2. Essentially, I would have Windows 7 on my laptop on one partition on the raw disk. The remaining space on the RAW disk (in my case 15 GB) will be allocated to a partition containing a VHD (Virtual Hard Disk) file, that can be mounted to boot the computer off the VHD file. I will be installing Windows Server 2008 R2 on this VHD file. Here’s how I went about doing it. 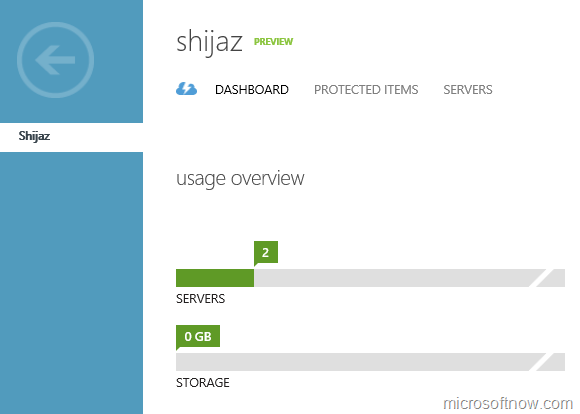 Since I did not have any unallocated space on my hard drive, I used the “shrink” option on drive C in Windows 7 (Computer Management) to get some free space – and got 15 GB unallocated as seen in the above screenshot. Next, I popped in the Windows Server 2008 R2 DVD. At the Welcome screen above, I press SHIFT+10 to launch the WinPE console. Type ‘LIST DISK’ to see the list of physical disks in your machine. Type ‘LIST VOL’ and look at what you’ve done :-). Notice the asterisk next to the new partition (in my case, it’s Volume 3). Type ‘ASSIGN’ to assign the next available drive letter to the selected partition. Now for the magic: ‘CREATE VDISK FILE=E:FILENAME.VHD MAXIMUM=15000 TYPE=EXPANDABLE’ – this creates a dynamically expandable VHD file filename.vhd on the new volume with a maximum size of 15000 MB. Keep the maximum size lesser than the size of the partition. Notice that once you finish this command, Windows 7 detects virtual hardware “Microsoft VHD HBA” and installs it. Type ‘ATTACH VDISK’ to attach the VHD disk. Type ‘CREATE PARTITION PRIMARY’ to create a primary partition inside the VHD. LIST VOL to see what you’ve achieved. Type EXIT DISKPART to close the utility and close the WinPE session. Next, continue with the Windows Server 2008 R2 installation from Windows 7. Do not choose the upgrade option, choose the New Installation option. Choose to install Windows on the partition you just created. When installation is complete, and you restart your computer, a boot loader menu appears, where you can choose to boot Windows 7 or Windows Server 2008 R2.